Faceplant Dreams...King and Queen Pillowcases. Wedding season begins with the Royal Wedding...give the perfect wedding gift, King and Queen pillowcases. This set of King and Queen pillowcases are not your ordinary deck of cards King & Queen pillowcases, they are Faceplant Dreams elegant, gloriously soft, 300 thread count, 100% cotton pillowcases!!! Celebrate the Royal couple in all of us. All Faceplant Dreams pillowcases are manufactured in a Fair Trade environment. Faceplant Dreams pillowcases...the perfect message for the perfect moment. 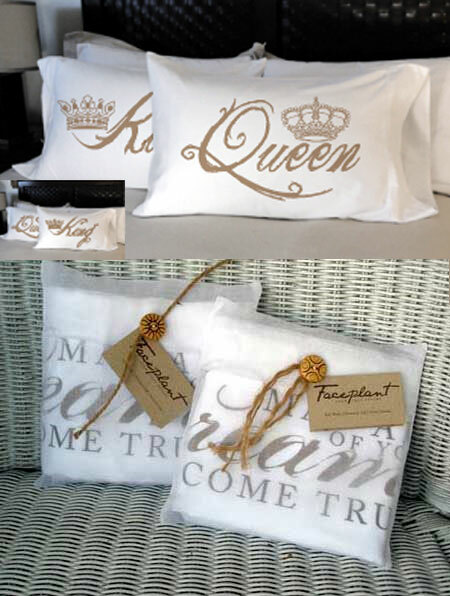 King and Queen pillowcases make the perfect gift for every occasion...everyone sleeps! "Say it without saying a word." Faceplant Dreams - King and Queen Pillowcases. Each gift set of two pillowcases are elegantly gift wrapped in a fabric envelope with a unique button to anchor the recycled, descriptive hang-tag.